Families of disabled children are taking action against cuts to special education provision. We are a group of families whose children have special educational needs/disabilities (SEND). Over the last few years we have seen the catastrophic impact of cuts to funding for our children. 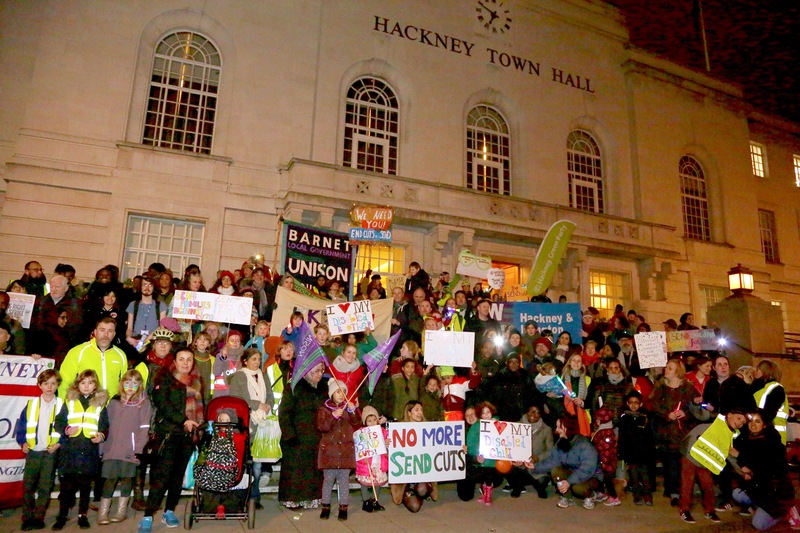 Cuts to SEND funding are being made by local authorities all over the country. These cuts are already being challenged locally. Bristol families recently won a judicial review against Bristol Council, forcing them to back down on cuts to SEND funding. Hackney and Surrey families are waiting for their cases to be heard at the Royal Courts of Justice in October. However, this is clearly a national problem. Local authorities are telling us there is not enough money, with many reporting deficits in their high needs budgets. Headteachers are telling us there is not enough money. In a recent survey of headteachers, only 2% of respondents reported that top-up funding was sufficient to meet the needs of pupils with SEND. But we don't need to be told. We see first hand the consequences of underfunding, not just for disabled children, but all pupils. Teaching assistants are being cut; specialist teachers are being cut; training is being cut; children are struggling to access speech and language therapy, occupational therapy, support from educational psychologists and specialist equipment and teaching materials. Without this support, teachers are finding it increasingly difficult to support the needs of pupils with SEND in mainstream schools. It also reduces their ability to meet the needs of the whole class, particularly when school budgets are already under pressure. For inclusion to be a meaningful reality, it is essential that provision is properly resourced. As a result of this underfunding, many schools are saying they can no longer afford to support children with SEND. Some are even refusing to admit disabled children, encouraging parents to remove them or excluding them. The number of pupils with SEND without a school place more than doubled from 2016 to 2017. That's bad enough, but the reality is even worse. There are increasing reports of children being off-rolled (unlawfully excluded), with parents left to educate them at home with little or no professional input. Exclusion can have a devastating effect on the self esteem and educational progress of children who are already struggling, as well as on family members, who often have to give up work. Special needs funding is in crisis. Local authorities are failing to meet statutory responsibilities to disabled children. Ultimately, central government bears responsibility for this, which is why we are exploring legal action against the Secretary of State for Education. We are crowdfunding to raise funds for initial legal costs, including obtaining advice from our legal team, investigative work in relation to our claim and pre-action letters. We estimate the cost of this will be £5,000-£6,000. If the legal team advises that there are grounds to issue a claim, we would then apply for legal aid on behalf of our children to seek to cover the cost of taking forward a judicial review. Disabled children all over the UK are seeing their funding cut. Some are being forced out of mainstream schools. Demand for specialist placements is increasing dramatically. But there aren't enough places. As a result, thousands of disabled children are not in school, in some cases for years. Spending on independent specialist schools is rising rapidly, placing further demands on local authorities and maintained schools. Disabled children's legal right to an inclusive education is being compromised by underfunding. Some are being denied education altogether. We can't stand by and let this happen. This is why we are taking action to bring about change for SEND families all over the UK and to improve conditions in the classroom for all pupils. Families have been campaigning hard for sufficient funding to meet the educational needs of pupils with SEND. A year ago we would have been lucky to get coverage of funding cuts in the local press. 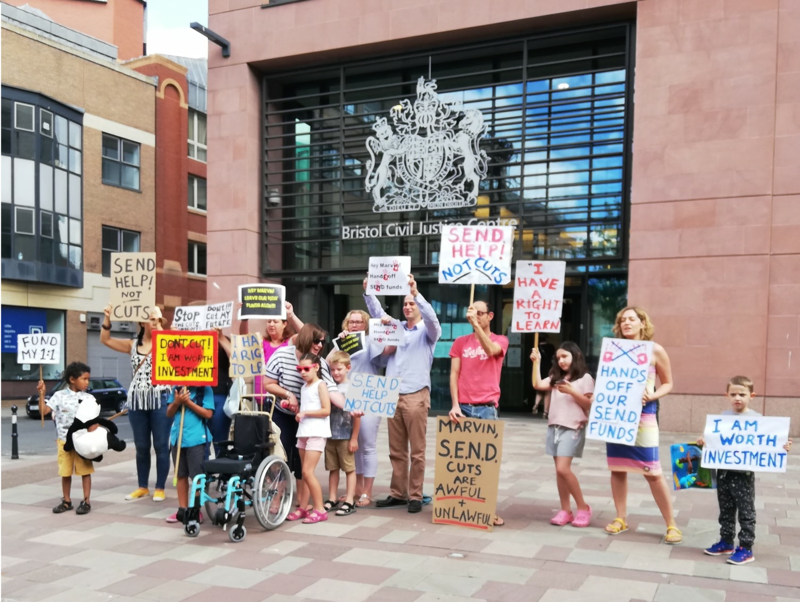 Now the SEND funding crisis is making national news and families are taking legal action in the high court. There are statutory duties towards disabled children and without adequate funding there is a serious risk that these will be undermined. We hope this case will set an important precedent and ensure disabled children's rights are enforced and protected. Hoping this action helps all children across the UK. My daughter is lucky - she does't need these services today. But in a year? Or 5? Your fight is for all children. Bless you. People need to realise just how bad the education funding crisis is. 1. s149 of the Equality Act 2010 (known as the “Public Sector Equality Duty” or “PSED”). This requires public bodies (including the government) to have due regard to the need to need to eliminate discrimination and advance equality of opportunity for groups with ‘protected characteristics’, which includes disabled children. 2. Section 7 of the Children and Young Persons Act 2008 . This imposes a substantive duty on the Secretary of State to ‘promote the well-being of children in England’. The Government has failed to make sufficient enquiries to ensure that it is properly informed about the relevant issues when making funding decisions. 4. Article 14 of the European Convention on Human Rights. This requires public bodies, including the Government, to act and make decisions in a non-discriminatory way. We contend that the Government has failed to treat disabled children sufficiently differently to other children to recognise their different needs, which is disproportionate and unjustified. 5. International conventions. We will also rely on international conventions, including the Convention on the Rights of Persons with Disabilities (“CRPD”), and the Convention on the Rights of the Child, which protect the rights of disabled children. We have requested a response to our letter within 14 days, which is the standard timeframe set for a response by the legal protocol for this correspondence. We will provide a further update at that stage. After just a morning we're already 25% of the way to our target thanks to your extraordinary support. Together we can bring about change for children and young people with SEND. Please spread the word and explain why this is important to you.